Funeral services honoring Roberta’s life will be held on Wednesday, February 6, 2019. A Mass of Christian Burial will be celebrated at 12:00 p.m. at St. Mary Catholic Church, 7400 39th Avenue. Private interment will take place in Green Ridge Cemetery. A visitation for Roberta will be held at the church, 7400 39th Avenue, on Wednesday from 10:00 a.m. until 11:45 a.m. In lieu of flowers, memorials may be directed to the Brookside Care Center Life Enrichment Program, 3506 Washington Rd., Kenosha, WI 53144. 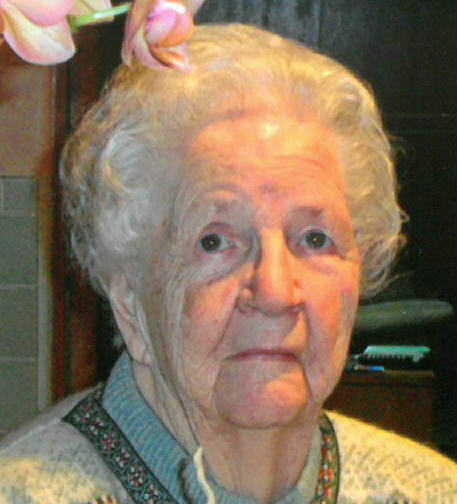 Roberta M. Rieschl, 93, of Kenosha, died peacefully on Friday, February 1, 2019 at Brookside Care Center. Born in Kenosha on June 6, 1925, she was the daughter of the late Robert and Margaret Seefeldt. Roberta was a graduate of Mary D. Bradford high school. On November 24, 1945, she married Andrew John Rieschl. As a teen, she worked at Lake Mary Resort in Twin Lakes. During WWII, Roberta tested airplane engine parts at Nash Motors and later worked as a seamstress at Jockey International. She was also was actively involved in multiple Rieschl family businesses. Roberta was a longtime member of The Jolly 15 Homemakers Club. As a flower lover, she was known for her beautiful Peony and Iris plants. In addition, she was also a member of the American Iris Society, and attended many national conventions. Roberta was an avid needle-worker, and especially enjoyed crocheting, which she taught at Gateway Technical College. She is survived by her daughter, Margene L. Rieschl; her son, Michael J. (Linda) Rieschl; her grandson, Andrew M. (Jesse) Rieschl; her granddaughter, Megan K. Rieschl; as well as many longtime friends and neighbors. In addition to her parents, she is preceded in death by her husband, Andrew John, and son, Andrew Robert. The Rieschl family would like to thank the dedicated staff at Brookside Care Center for their compassionate care.